Back in 2012 I was chasing with PDS Storm Tours and we were having a really slow week. We had pretty much called off the chase when the winds shifted on our last day and an opportunity appeared in Kansas on our way back to Oklahoma. I have put up the whole story here but I will explain the chase briefly. After driving literally from New Mexico to North Dakota and back we arrived in Russell County, Kansas, and finally had a storm to chase. It quickly grew into a supercell but refused to produce a tornado. We were nervously waiting for it to get its act together while the sun was setting and the time was running out. 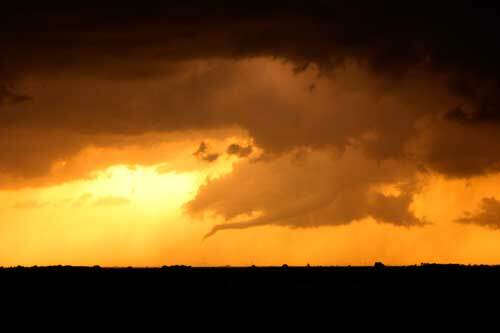 Finally, in the most amazing setting you could imagine, a tornado appeared in a perfect orange sunset. It was one of the most amazing things I had ever seen – but something more intense was yet to come! Russell County sunset tornado of May 25th, 2012. This is, however, not the photo I mean. We stopped to take some photos of the lightning and started driving south, back to Oklahoma. There were storms around us and I don’t remember if they were tornado warned or not but I was eagerly looking out through the window – looking out on the field to our right in order to catch a glimpse of a tornado where the wall cloud was supposed to be, some mile to our right. The lightning was very frequent so once every 1-2 seconds I was able to see it. After a while the wind started shifting and it became really windy. Something was going on so I rolled down the window and looked outside. Still with my eyes focused on the field about a mile away. Then, during one of the flashes I saw something that will forever be caught in my memory. The all too recognizable shape of a tornado that was just above us but bent like an elephant trunk touching down to our right ! I could only see a part of it and only when it was briefly lit up by lightning. The most terrifying part is that its base was just above our truck! We were literally driving underneath it! A few flashes of lightning later we were already passed the tornado and couldn’t see it anymore. I was nowhere near taking a photo of the tornado but was glad to be alive and having experienced something as thrilling as that. This is where the story ended. Last week I posted a (really bad) video of the Russell County sunset tornado we saw earlier that evening. Gene Robertson (of PDS Storm Tours) helped me out with the info of where we saw the tornado so I could tag it properly on YouTube. By doing so I found some other videos of the same tornado, taken by other storm chasers. It was neat to see it properly, sometimes more close-up and with better quality. at 3:45 something happens that just blew my mind! Dave had caught the tornado that we were driving underneath on both video and camera! Used with permission. Copyright Dave Lewison. Now this is an amazing shot just to begin with and one may not notice at first that there are two tornadoes in the shot. The right one is the tornado we were driving underneath. Just having that caught on video and camera, and in such an amazing photo is just better than I would ever had hoped for. 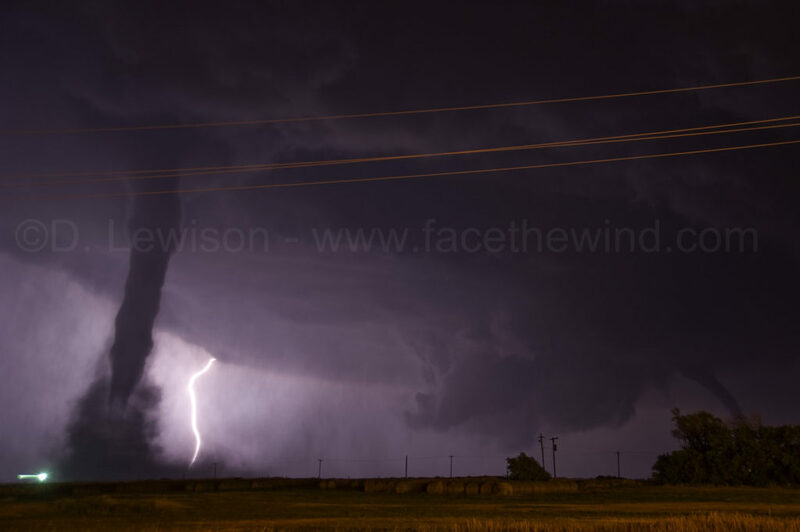 What this photo also conveys, making the story even more exciting, is that we, obviously, must have driven past yet another tornado in the dark (the left one in the photo)! I am quite certain it was the right one I saw since it is clearly bent, in a way the left one is not. It could literally have been our car that is seen driving on the photo (although I don’t think so).